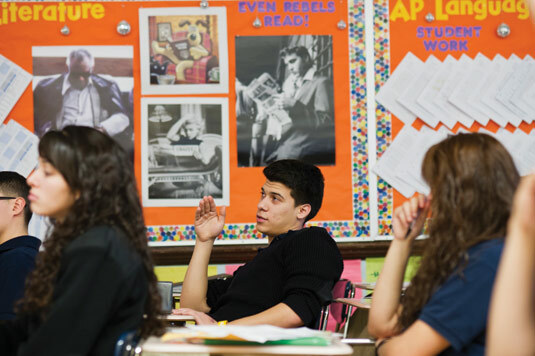 In an effort to expose more students to college-level work, CPS has in recent years pushed more students to participate in Advanced Placement classes. The district has included AP enrollment in its school achievement formula, grading principals on the number of students who take AP classes and pass AP tests. In some ways, the policy has worked: Since 2000, CPS has quadrupled the percentage of students taking AP classes citywide, with participation increasing by an average of 13 percent every year. The district even won an award from the College Board in 2011 for its progress between 2008 and 2010: increasing the number of students taking AP classes, improving minority students’ pass rates by 2 percentage points, and increasing the number of minority students passing AP tests by 718 students over the course of two years. But in one crucial way, the district’s effort has fallen short. Despite all-around improvement, the district has seen a widening disparity in pass rates between minority and white students. White students’ pass rates have risen by 21 percentage points, to 66 percent. Latino students’ pass rates have increased by 7 percentage points, to 36 percent. African-American students’ pass rates are stagnant at 14 percent, compared to 16 percent in 2000. In spring 2012, a mere 2 percent of all African-American high school students and 6 percent of all Latinos passed an AP test, compared with 18 percent of all white students. At 17 mostly minority high schools, not a single student passed any AP test. Nationwide, the past decade has seen a dramatic increase in the number of students taking AP exams—3.7 million tests in 2012, compared to 1.4 million in 2001. During that time, pass rates dropped 2.5 percentage points. The newest president of the College Board, David Coleman, has stressed the goal of broadening access to AP courses to ensure that minority students get a shot at the benefits of AP coursework. Schools that have successfully raised their pass rates say that it’s important to offer a wide variety of AP classes, plenty of study sessions, and adequate teacher training in what an AP class should look like. They also note the importance of exposing students to AP-level classes as early as freshman year. Auditi Chakravarty, vice president for AP curriculum, instruction and assessment, stresses the importance of making sure students get on track early. “There is only so much that a teacher can do in the AP classroom,” she says. The adoption of the Common Core State Standards should ensure that more students are prepared for AP classes, she adds. The College Board publishes curriculum guides that aim to get students on track as early as middle school. Chakravarty says it’s also important to get students into classes that are the right fit for them. Black and Latino students may end up in courses that they are not prepared for, but don’t get the chance to take classes they could do well in, she explains. For instance, they may be ready for AP psychology, but not for AP calculus. “Their school may not offer AP psychology—does the school offer the courses?” Chakravarty says. Polk County Public Schools, in Florida, has seen the same trend as Chicago. Since the 2006-2007 school year, the district has more than doubled its Advanced Placement enrollment, but pass rates have declined overall. Rebecca Braaten, director of academic rigor and secondary curriculum and instruction, says the district has asked all high schools to host AP parent nights to target incoming 9th-grade students. One goal is to promote the program. “It’s also kind of a reality check. We want to make sure the kids understand what they are getting into,” Braaten says. Students are also discouraged from dropping AP classes in cases where they “just don’t want to work that hard,” Braaten adds. Many schools are using the College Board’s SpringBoard curriculum, which is meant to prepare students for AP classes. Plus, scores of 2 out of 5 on an AP test are considered a sign of progress, especially if a student was previously behind academically. For teachers, Polk County Schools holds training days where all AP teachers in a given subject come together and look at test results to evaluate how they need to improve their teaching. Frederick Douglass Academy in Austin had been on the list of high schools where no students passed any AP exam. In fall 2006, the school began offering AP classes to an average of 60 students each year. But nobody passed a test until spring 2012, when four students did so. Extended-response questions have been the biggest stumbling block for students, notes Principal Vanessa Perry. This year, Douglass is offering four 4-hour review sessions the semester before the tests. “Although [students] may know the material, they find it most difficult to be able to communicate it effectively,” Perry says. At Chicago Vocational Career Academy in Avalon Park, no students have passed an AP test since spring 2005, when two passed. Now, Chicago Vocational offers human geography, statistics, psychology, biology, and studio art. On a cold December day, AP statistics teacher Megan Payne leads a discussion on sampling. Payne explains later that she tries to run her classroom like a college-level class, in order to shepherd students toward more independence. “I try, as soon as I give instructions, to step away—create the college-level atmosphere of letting them form their own study groups,” she says. Payne assigns homework on a weekly basis—typical for college—rather than as a set of problems that are due each day, in order to teach time-management skills. “Statistics is not a ton of math—it’s a ton of logical thinking. A lot of it is going to be foreign to them, regardless of if they had math or not,” Payne says. This year, 117 freshmen are also taking AP human geography, a social science course about how geography shapes culture, politics and land use. Maclin took the idea from Whitney Young High School, which offers that class to its freshmen as a way to get them used to AP classes and tests. Next year, he hopes to offer AP U.S. history to sophomores. Chicago Vocational has also begun offering Spanish to freshmen, to build a group of students who might be able to take AP Spanish as seniors. Extra math built into honors chemistry classes gives students the opportunity to prepare for AP chemistry. To reinforce the high-level writing and reading comprehension skills needed on AP tests, Maclin has added drama electives, in which students write their own poems and plays. Maclin has found another way for students to earn college credit: dual-enrollment classes at the City Colleges of Chicago and Chicago State University. Of 23 students who took part last year, 22 passed a course. Tell us what you think. Leave a comment below or email rharris@catalyst-chicago.org.